WS54OD - Outdoor living has never been so luxurious. Town & Country sets the bar for fireplace design. 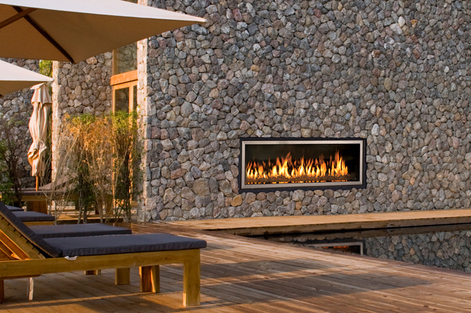 Built to face the Montana elements, the Wide Screen54 Outdoor gas fireplace can withstand temperatures up to -40C while disappearing ceramic glass ensures Town & Country's signature bold flames are always sheltered from wind. Electronic ignition converts to standing pilot at the push of a button! Super easy! 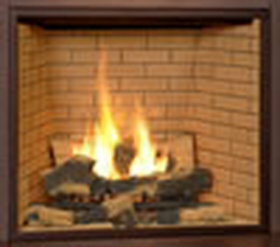 Manhattan Brick Panels: Experience the truly traditional look of a masonry hearth with beige brick in a full stacked pattern. Park Avenue Brick Panels: Achieve a formally elegant look with traditional beige brick panels in a full herringbone pattern. 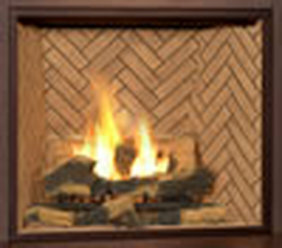 Mount Vernon Brick Panels: Wrap your fire in a warm russet glow with a traditional full herringbone pattern in a classic Heritage Red. Titanium Porcelain Panels: Present a sleek, clean and modern style – the definitive mood of urban contemporary design. Copper Porcelain Panels: Enjoy warmth and modernity together with the natural beauty of metallic copper. Black Porcelain Panels: Create the ultimate clean, contemporary look and enjoy huge flames amplified by the polished finish of Black Porcelain panels. Coffee Bean Brown Porcelain Panels: Enhance the look and feel of your fire with the rich, reflective earth-tones of these clean and modern panels. 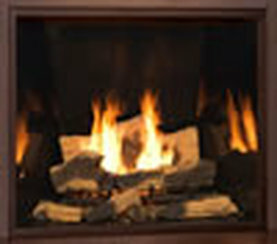 The Country Home Burner: Truly traditional. 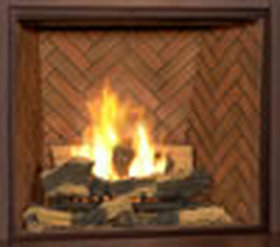 Country Home logs boast the robust look of hand hewn rounds stacked among pillars of bold Town & Country flames. The Black Diamond Burner: Dare to go ultra modern with tumbled glass available in four dynamic colors: Black Diamond, Pacific Diamond, Twilight Diamond and Desert Diamond. The Tranquility Burner: Reflect your contemporary lifestyle with the contrast of vibrant fire and cool river rock and white sand. A 2006 VESTA award finalist. Metropolitan Stone Sets: Experience the ultimate glamour with the new Wide Screen Metropolitan Stone design option, featuring high gloss black or grey stones set on a bed of glistening black sand. 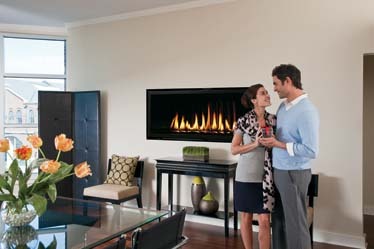 Venting Options-please speak to a sales representative. *Please note Bare's Stove and Spa strives to keep information current and updated. However, please use these only as a reference, current manuals and information from the manufacturer take precedence.